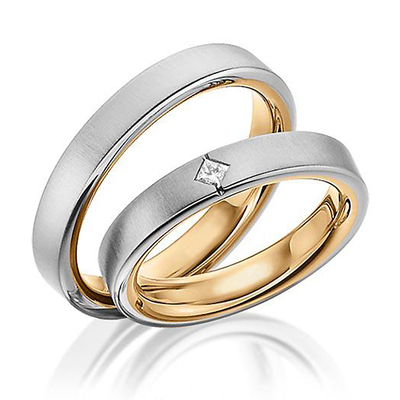 Contemporary two tone Flat design comfort fit wedding band set. Her band accented with princess cut 0.10 ct. FG VS diamond with kite style setting. Wedding band set is displayed with sating finish also can be finished with high polish(shinny). Color combination can be build with other available gold colors with your request. Diamond size 1: 1 piece x 2.5x2.5mm Princess cut with Channel Set - G/H Color - SI1 Clarity - 0.1 ct.tw.